With summer months comes plenty of family activities — vacations, holiday parades, festivals, camping, barbecues … the list goes on. The longer (and yes, often hotter) days also brings with them other, less fun family adventures. Like moving. Yes, mid-spring to mid-fall are prime relocating times for families of all shapes and sizes — you can tell by the numerous social media posts bribing readers with pizza and beverages in trade for heavy lifting and joint manual labor. But what if the only extra set of hands you have belong to your young kids? This may seem slightly crazy — but take a box or two over of things your kids like to play with so that when you’re busy moving heavy objects, they can be working on puzzles, coloring, or blowing bubbles. The younger they are, the more frequently they will oscillate between being “helpers” and being bored with it all. Having things at your new place right away, just for them, will help ease the transition. A quick trick that’s worked for a few families we know is taking over special, not-your-average-grocery-run snacks over to your future home so when the kids inevitably get hangry, you have Very Exciting Snacks to woo them with. Also stock up on paper plates and cups so you don’t have to unpack a kitchen just for one plate of cheddar crackers. You also don’t want to get stuck in the routine of fast food or delivery, so the more nutritious staples you can establish early, the fewer carb and sugar crashes you can anticipate later. Children are capable of so much more than even we, their parents, often allow them. Kids, especially little ones, will gain a beaming sense of pride just from carrying in a pack of toilet paper into the new bathroom, or their own size-and-weight-appropriate boxes of clothes, books, or other personal items into their new sleeping space. As long as they have gross motor skills solidly down, they can truly be of help. For slightly older kids, letting them pack their own things or decorating the boxes that they pack can help foster strong positive associations with the impending relocation. Change is incredibly hard, and for many kids moving me very well be the first Very Big Change they have to deal with. Seeing their old home empty could really cause some sadness, confusion, anger, and anxiety, so take the time to say your goodbyes together. If they have stories about each room, or want to give each window a good-bye kiss (or nose print), let them. Watch how your littles process these big things and encourage them that their feelings are valid and that you hear them. A great way to ease some anxiety may be to take pictures of your home before you begin to pack, so that the kids have photos to back up their memories once the move is complete. Adjusting will take time, but the support you show them amid all the moving chaos will stick with them through many other Big Changes in life. Namely, their room — whether that’s a bedroom, playroom, outside treehouse, reading corner, you name it — give them some manner of space over which they have direction. As the parent you can always veto major design choices (like paint-splattered walls or neon green carpet) but handing over the reigns of a smidgen of your new kingdom to your scions will only build up their confidence and help them feel like your new home is theirs, too. 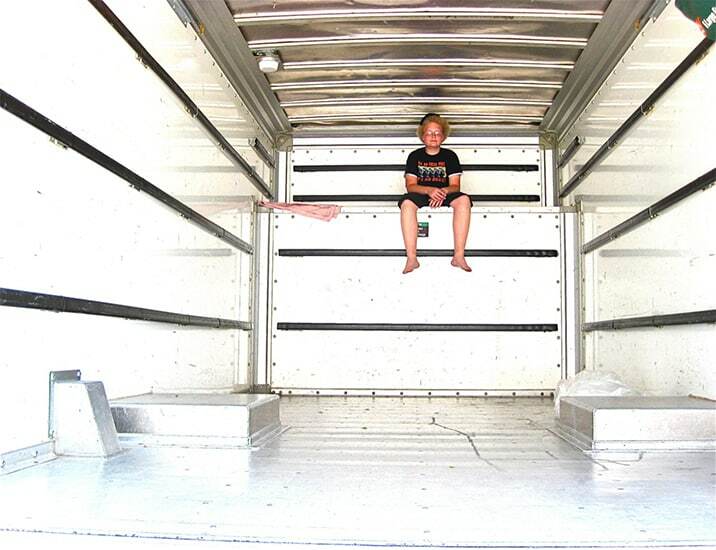 Let us know your tips and tricks for moving with younger kids — we all could use all the help we can get!